Undoubtedly, an outdoor fireplace or a fire pit provides families and homeowners a lot of enjoyment. Besides adding heat, light, and a fun experience, a fire feature also adds ambiance to an outdoor space. 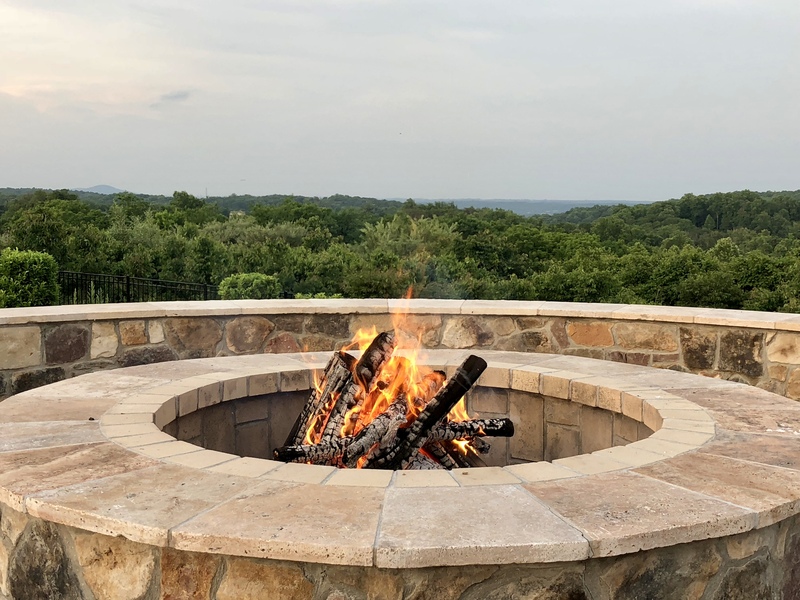 While outdoor fireplaces and firepits are both appealing, they are different structures that provide different experiences. Let’s examine the differences. In trying to decide which option is right for your family, it’s important to determine how the space will be used. There are similarities between the two features, but many differences as well. You sit primarily in front of it as opposed to around it. It makes more of an elegant architectural statement on your property. The smoke is directed up and out of a chimney. It takes up less space on the patio. It can be incorporated into a pavilion, and a television can be mounted. If part of a pavilion, it can be used in rainy weather. You gather around a fire pit, therefore it feels more interactive. You can move completely around most fire pits, and create seating on all sides. A portable fire pit can be easily moved around the patio or yard. If you are looking for an interactive fire experience, then a fire pit might be the right choice. It tends to be a good fit for families with children who envision themselves spending a lot of time around the fire roasting s’mores. A fire pit will take up significant space on your patio and in your yard, which is important to remember when making the decision. This beautiful space and fire pit belongs to our friends. I love the dedicated space of the pit in the yard and the fun interactive experience it provides. If you’re thinking more about ambiance, then an outdoor fireplace may be a better choice for your yard. A fireplace isn’t quite the same interactive experience as the open fire pit, but it still gives you heat and ambiance and has a sense of elegance to it. Take for example our backyard fireplace. It sits on the patio and is located fairly close to the house. There is not enough room in front of the fireplace for a sofa, but a couple chairs fit adequately in the space. Seems to me that our fireplace was built more for ambiance than function. It is not ideally located in the yard, and blocks the view of the home from this angle. As I mentioned to you in an earlier post HERE, we are working with a Landscape Design Company. Their recommendation is to remove the fireplace structure completely…Wo! That is a big decision! That idea had not occurred to us, but we are slowly coming to realize the potential of the space if the structure was removed. Our goal is to add a swimming pool to the yard, but as it stands now, the fireplace would obstruct the view of the pool from the inside of the house. If we removed the fireplace, we would add a fire pit, most likely a permanent structure like the one our friends have in their yard. This beautiful pit provides hours of enjoyment for everyone sitting around it. Another, more affordable option is to choose a free standing fire pit. These fire features can be easily moved around the patio, and many of them can be outfitted for propane or gas. Some great options to consider are HERE, HERE and HERE. Of course, it doesn’t have to be an either/or scenario. If you can’t make up your mind regarding the fireplace vs. fire pit, there’s nothing to say you can’t incorporate both. Big decisions! What would you do, would you remove our fireplace? Drop me a line and give me your thoughts. For more outdoor and gardening tips, subscribe to Happy Haute Home and follow along on Pintrest HERE, and Twitter HERE and feel free to pin and tweet your favorite pics from Happy Haute Home. I love the fire pit idea!! Either way I know it will be beautiful! Thank you Toya! I appreciate your suggestion, I am leaning that way..a bit nervous but I think we will be happy with the end result. Fire pit!!! we had one at our old house and LOVED it!!! One more vote for fire pit! Thank you so much! I look forward to having one. I like the built in option as well. Have you had any issues with the stone cracking from the heat? A friend of mine was recently telling me about this issue. Thank you Lynn for your suggestion!